KANEOHE, Hawaii - U.S. Pacific Fleet (PACFLT) Master Chief Marco Ramirez visited various commands at Marine Corps Base Hawaii Oct. 17, updating Sailors on Fleet priorities and discussing issues of concern. 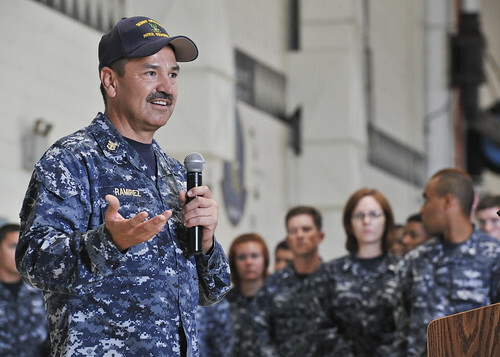 During an all hands call and luncheon, Ramirez answered Sailors' questions about topics that included CPO 365 training, sexual assault and prevention and warfighting readiness. He also toured the Third Marine Regiment regimental aid station, various air squadrons and had an office call with Capt. Lance Scott, commander, patrol and reconnaissance wing two. "I wanted to come out to Kaneohe Bay and talk with Sailors and unite them and let them know PACFLT's thoughts about the mission and priorities and how we value them and their service," said Ramirez. Ramirez has been traveling around the world introducing himself to the fleet and sharing PACFLT's priorities and mission since his selection as Fleet Master Chief in March. "I think it's important to come out and share what the commander's mission is and what his priorities are," Ramirez said. "The United States Pacific Fleet protects the sea lanes and keeps them open, that's exactly what we do. And not only do we keep them open but we work with our partners, our allies and our coalition forces and work well with them, so we can enhance keeping those sea lanes open," he said. "If we meet aggression then we're going to try to deter it and if we can't we're going to fight, that's the mission of our Pacific Fleet." Sailors took advantage of the question and answer session of the all hands call and said they appreciated Ramirez's visit. "It was very informative; we talked about the mission, DUI's, CPO 365 and anything that encompasses our daily routine," Information System's Technician 1st Class Robert Leviker, Patrol Squadron (VP) 9 said . "It was nice seeing Fleet Master Chief during the all-hands call and being able to ask him questions and having him listen to our concerns and tell us his thoughts and advice about different issues." Ramirez is the 16th U.S. Pacific Fleet Master Chief and is the senior enlisted advisor for more than 140,000 Sailors who serve on approximately 2,000 aircraft and 180 ships and submarines.